With over 25 years of breeding experience, Darien Equestrian can boast some of the best breeding lines in the world in both dressage and jumping. We have produced 3 top 10 KWPN North American Keuring placings. A North American Grand Champion (Wind Dance) and a North American Reserve Grand Champion (Windstar). All of our young stock presented at Keurings have received the much sought after First Premium status! Gintaras (Farrington x Wind Dance) was USDF Breeders Series National Grand Champion in 2013. As riders, our goal is to breed horses that are not only beautiful, but horses that we would want to ride ourselves. 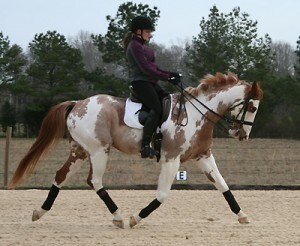 We not only look at conformation and gaits, but for excellent temperaments, rideability, and soundness. Both sire and dam lines have to prove themselves by their success and longevity in the show ring or success in producing offspring that are successful. We have a wide assortment of horses to choose from: some suitable for the adult amateur as well as for the discerning professional. All horses are carefully watched from the time that they are born so that we may give you an accurate assessment of the suitability of each horse for your particular endeavor. Our motto is "that there are a lot of good horses out there, but if you want a really good horse, come to Darien Equestrian! The goal of our training system is to produce well-mannered, obedient horses that are a pleasure to work with. We start very young, right after the foals are born, with imprint training. 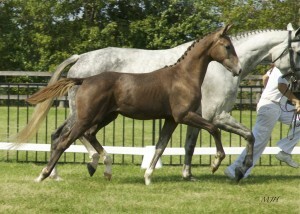 Foals are taught behaviors that will make them easier to handle as they mature. Yearlings and 2 year olds are periodically worked "in-hand" and when they are 2 they are exposed to bitting, lunging, and accepting a little weight on their backs. All youngsters are taught to free jump in a chute with the jump height adjusted to a suitable size for their age and level of experience. Most youngsters learn to travel to other farms and shows to gain experience trailering and visiting unfamiliar surroundings. They learn simple manners such as standing for the farrier and the vet, being groomed, clipped and having their manes pulled. It's no wonder that by the time they are ready to break as 3 year olds, it is a pretty straight forward process. Mature 3 year olds are lightly ridden 3-4 days a week to establish an easy work routine while they are the most malleable. In the summer of their 3 year old year we try to bring 3 year olds out to ride in schooling shows if possible. All horses are allowed to develop at their own pace. We are proud to produce happy horses that look forward to being brought out to ride. Although we don't adhere to any one riding system, our training methods are best described as classical. We don't believe in the use of gadgets or other artificial aids, just tactful, quiet riding by very experienced riders and trainers.